I've recently gotten into the habit of walking up and down the baking supply aisle in every grocery store I go into. Most aisles are pretty basic here in the city so when I took a trip to Target in Brooklyn, I was awed at all the goodies they have there! 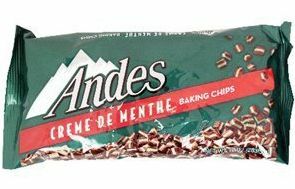 One thing that caught my eye - Andes Creme De Menthe Baking Chips! I've always been a fan of the Andes Chocolate Mints when I was little, so why not make cookies using these baking chips! I went on the Andes parent company website (www.tootsie.com) and pulled down a recipe for their Andes Creme De Menthe Cookies. Its a basic cookie recipe with a minty twist - perfect for you all to try! All my ingredients ready to go! Preheat oven to 350° F. Blend butter, sugars, baking soda, baking powder, vanilla and eggs until mixed. Since butter is one of the ingredients, I used a pastry blender (which is one of my favorite tools!) to cream all the dry ingredients into the butter. If you don't have a pastry blender, a fork or spoon will work just as well. Stir in Andes Baking Chips and then flour. Not sure why the recipe calls to add the flour last...maybe less gluten? Either way, it works and the cookies taste great at the end! Followed by the Andes Baking Chips and flour! Cookie dough is almost ready to be eaten! Cover with cling wrap so the dough doesn't dry out and chill for approximately one hour in the refrigerator. I know many of you may want to skip this step in the interest of saving time, but chilling the dough is what keeps the dough firm. Making cookies with room temperature dough will give you very flat (and unltimately crispy) cookies. If you want thicker and chewier cookies, make sure to chill your dough! After chilling your dough, measure out approximately 1 oz. of dough. Form a ball and slightly flatten. Many use an ice cream scoop, but since I don't have one I substituted with a 1/4 cup measuring cup. Raise oven rack one level above the middle and bake on non-stick baking pans. Bake at 350° F for approximately 8 - 10 minutes. Cool on pans for two minutes before removing. And after you bake, these are great to pack up and bring to work. They are nice and chewy and definitely mintymintyminty. Your colleagues will love it and will love you for bringing it in! Chinese New Year and Dragon Cupcakes!